Over 20 million premature and low-birth-weight babies are born each year around the world. Four million of these die, and those who survive often grow up with life-long illnesses. One of the main causes of this is hypothermia; these babies don’t have enough body fat to maintain their own body temperature. Traditional incubators are expensive, require constant electricity, are complicated to use and are often only found in major urban hospitals. In the absence of any appropriate equipment, current local solutions include wrapping hot water bottles around babies, placing them over hot coals or placing them under light bulbs—all extremely dangerous and ineffective methods. 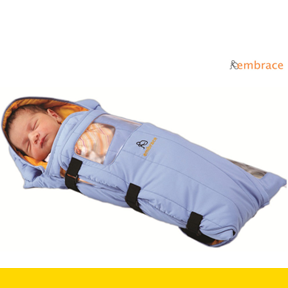 The Embrace Infant Warmer is an innovative and affordable product designed for premature and low-birth-weight babies in developing countries. It was designed around the specific needs and living conditions of these communities. It has three components: a baby interface or sleeping bag, a pouch of phase-change material and an electric heater to warm the pouch. Users first insert the pouch into the electric heater, and once it melts the user places the heated pouch into the sleeping bag and places the baby inside. The pouch will remain at 98.6 degrees for at least four hours. The dynamic phase-change material absorbs heat from the baby if the baby gets too hot or releases heat if the baby gets too cold. The pouch has an indicator that shows when it must be reheated, and the pouch can be reheated hundreds of times. Through its user-centric design, the Embrace Infant Warmer addresses the functional requirement of safely providing warmth to low-birth weight babies but does so while meeting the usability and cost requirements that are unique to this population. To address the challenge of intermittent electricity, which is pervasive throughout rural clinics, the phase-change material uses an electric heater for only 35 minutes. Because the pouch need not be continuously connected to an electricity source, the infant warmer becomes highly transportable, allowing physicians and patients to transport babies from villages to hospitals, between hospitals, and within hospitals all while providing critical warmth to help these babies survive. Perhaps most importantly, this transportability lends itself well to promote mother and child bonding. Babies who were once required to sit isolated within a neonatal intensive-care unit to receive warmth can now lay by their mothers’ side. Impact is not simply achieved by providing a solution, but also through the users’ ability and willingness to use that solution. To this end, the infant warmer’s clean intuitive design means that its one-button operation allows even unskilled staff to operate it. And to accommodate the resource constraints of clinics that often hinder access to care, its simple elegance paired with manufacturing expertise means that this device can be provided at a fraction of the cost of traditional incubators, so the people who need it the most can afford it.